Serious questions and doubts hang over the new MOU signed between the United Nations and the government of Burma on a supposed framework for creating conditions for safe return for Rohingya refugees. For a start, to date, it’s a secret deal. It’s about the Rohingya but the Rohingya are not allowed to see it, let alone have an input into what it contained. It allows the UN some access in Rakhine State but it is not clear how much. Will the UN have unrestricted access at last, or have they compromised? Even before the latest Rohingya crisis began in August last year, restrictions on humanitarian aid in Rakhine state were unacceptable and costing lives. Does this deal even take us back to that previous unacceptable situation? The government of Burma should not be praised for merely returning access to the same, or less than, the situation prior to August 2017. The two steps back one step forward and then receive praise for the one step despite things being worse was a game successfully played over and over again by the previous military regime. It’s time to stop falling for it. The UN says the agreement will allow it to provide independent information to Rohingya refugees about the conditions in their place of origin so that they can make informed decisions about return. (Link: http://www.unhcr.org/news/press/2018/5/5b0fff7b4/unhcr-undp-agree-text-mou-myanmar-support-creation-conditions-return-rohingya.html) With the increased militarisation of Rakhine State, the situation can change very rapidly with soldiers being able to move into Rohingya villages even more quickly than before. The local and national situation can change very rapidly. While information about what happened to their homes and villages is obviously important, it’s the general political and security situation which is most important in allowing Rohingya to assess conditions for safe return. The Advisory Commission recommendations on citizenship were a compromise and didn’t go as far as they should have. The Commission recommends the Myanmar government implement the current 1982 Citizenship Law. This is despite the Commission itself stating: ‘Several aspects of the 1982 Citizenship Law are not in compliance with international standards and norms – such as the principle of non-discrimination under international law – as well as international treaties signed by Myanmar. Most notably, the Convention on the Rights of the Child (CRC).’ http://www.rakhinecommission.org/the-final-report/ ) The Rakhine Commission, is therefore, urging the government of Myanmar to more fully implement a law that violates international law. The Rakhine Commission recommendation of an ‘acceleration of the citizenship verification process… under the 1982 Citizenship Law’ is unacceptable to most Rohingya and is no guarantee that citizenship will follow. It is a completely unnecessary step. Given the track record of the Burmese government in delay and deceit, the Rakhine Commission recommendations on reform or repeal of the 1982 Citizenship Law are far too vague and weak when it comes to implementation. It states: ‘..the Commission recommends the Government set in motion a process to review the law. As part of such a review, the Government might wish to consider the following: …Within a reasonable timeline, the Government should present a plan for the start of the process to review the Citizenship Law.’ They suggest the government ‘might wish’ to consider recommendations regarding changing the law which should be considered essential. Backing down to these demands was one of the first of many compromises made over the rights of the Rohingya which encouraged the Government to believe, so far correctly, that they could get away with what they have now done to the Rohingya. Until 2012, the EU, USA, UK and others had been unequivocal about the need to reform or repeal the 1982 Citizenship Law. Agreeing to ‘pathway’ language was an ethical and tactical mistake which appears to be being repeated. The United Nations and the rest of the international community should be unequivocal about the need for immediate full citizenship for the Rohingya. This should be a minimum condition. The agreement does not include the military. Of course, in general, agreements like this are made with governments, but not including the military ignores the reality on the ground. The government does not control the military. It cannot guarantee safety as the military can independently decide to launch another offensive against the Rohingya at any time. The military have made no commitment not to repeat what they have just done. Also needing clarification is the claim that the UNHCR will be able to carry out protection activities. 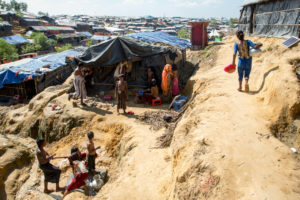 (http://www.unhcr.org/news/press/2018/5/5b0fff7b4/unhcr-undp-agree-text-mou-myanmar-support-creation-conditions-return-rohingya.html) When tensions rise ahead of violence, the UN pulls staff out of areas where Rohingya live, or they are likely to be expelled in advance of any new military offensive. Given this, is there a danger that the UNHCR is giving Rohingya the impression the UN will protect them if they return, when in fact they are powerless to do so? What can UNHCR staff on the ground really do to protect villagers if the military arrive? The Rohingya already have an identity. The problem is not that they need an identity, it is that the government of Burma is trying to deny that identity. The United Nations should be unequivocal in defending their right to their identity. The UN Co-ordinator also conspicuously tried to avoid using the name Rohingya when talking about the agreement about the Rohingya, and the two paragraph UN statement on the agreement about the Rohingya also avoided using their name. (http://www.undp.org/content/undp/en/home/news-centre/news/2018/UNDP-UNHCR-MOU-Myanmar.html) Not using the word Rohingya is not a neutral decision. It is backing down to the demands of racists who want to expel all Rohingya from Burma. Rohingya living in camps in Bangladesh have not been demanding, safe, voluntary and dignified return, whatever that means. When the UN Security Council delegation visited the camps, their demands were clear. They called for immediate full citizenship as a condition for safe return. They called for justice and accountability, knowing that impunity encourages further violence against them. While a renewed emphasis from the UN on citizenship is welcome, this agreement appears to have backed down to the Burmese government agenda of so-called pathways to citizenship. All evidence points to this being a delaying tactic, used by both Thein Sein’s government and Aung San Suu Kyi’s government. With her majority in Parliament, Aung San Suu Kyi can pass a new citizenship law in line with international law and standards giving all Rohingya citizenship, any time she chooses. But the longer there is delay, the harder it will become. Immediate movement on reforming or repealing citizenship must be an essential precondition for safe return. Min Aung Hlaing and his military have paid no price for what they have done. Support for an ICC referral and the prospect of justice and accountability would be one of the most effective ways to start a process of ensuring safe return. As long as Min Aung Hlaing believes he can keep getting away with violating international law, he will do so, as the escalating conflict in Kachin state demonstrates. The new agreement between the United Nations and the government of Burma might be an important step forward in the public relations agenda of the government to try to avoid stronger internal pressure, but there is no indication yet that it is a step forward in ensuring safe return for the Rohingya and moving closer to a lasting solution. Making the agreement public would be one obvious way to alleviate concerns.